Talk with your child&apos;s doctor. Your child&apos;s doctor can help your child understand why physical activity is important. Your child&apos;s doctor can also suggest a sport or activity that is best for your child. Provide a safe environment. 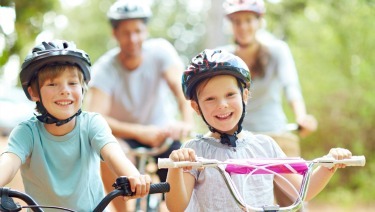 Make sure your child&apos;s equipment and chosen site for the sport or activity are safe. Make sure your child&apos;s clothing is comfortable and appropriate. Do not overdo it. When your child is ready to start, remember to tell her to listen to her body. Exercise and physical activity should not hurt. If this occurs, your child should slow down or try a less vigorous activity. As with any activity, it is important not to overdo it. If your child&apos;s weight drops below an average, acceptable level or if exercise starts to interfere with school or other activities, talk with your child&apos;s doctor. Exercise along with a balanced diet provides the foundation for a healthy, active life. This is even more important for children who are obese. One of the most important things parents can do is encourage healthy habits in their children early on in life. It is not too late to start. Ask your child&apos;s doctor about tools for healthy living today. The parents of an injured student will be notified of the accident/injury by the principal/administration or the principal/administration&apos;s designee as soon as reasonably possible, taking into consideration such factors as the apparent severity of the accident/injury and the priority of providing assistance to the student. If an incident results in a medical condition or injury which can be reasonably known to the appropriate supervisory faculty/staff member and/or the principal, the school and/or its staff are authorized to render reasonable basic first aid if such direct medical assistance would, in the opinion of the school, serve to minimize the severity of the injured person&apos;s condition. In addition, staff may secure professional diagnosis and/or treatment if such action, in the opinion of the school, appears to be reasonably warranted. The school and school officials shall be expressly held harmless from any liability costs or expenses associated with the professional diagnosis and/or any treatment or first aid provided (including but not limited to the cost of transportation), such costs or expenses being the responsibility of the injured party or, if a student, the student&apos;s parents. The school nurse or principal’s designee will record the circumstances of all accidents, (e.g., date, time, injured party, immediate cause, involved parties, supervisory facility/staff member, treatment/action taken, etc.) in the individual student health record. A separate Diocesan Accident Report Form (see Appendix F-7) is completed for all significant accidents or injuries that may require treatment outside of school. A copy of the accident report is retained as a separate, internal school record, with the original forwarded to the Diocesan Insurance Risk manager at the Chancery within 72 hours of the accident or as soon as possible in the case of major accidents and/or injuries. Our school provides a health office, apart from the student population, where children who become ill or injured can be cared for following Virginia School Health Guidelines. Children with fevers, contagious, or infectious diseases will be sent home promptly and excluded from school while in that condition, per Virginia Department of Health regulations. Once the student is confirmed to be free of communicable illness by a healthcare provider or is fever free/symptom free for 24 hours without taking anti-fever medications, the student may return to school. When a student is requesting a waiver from participating in Physical Education classes and/or recess, parents are required to submit a written statement from their child’s physician which states any activity restrictions with regard to participation in Physical Education classes and/or recess. The statement is expected to include a specific time frame for the activity restrictions. After the first dose of any medication has been given at home; When the parent / guardian provides and transports the medication to and from school and the medication is given directly to the school nurse/health assistant, or a senior member of the school administration; When there is a health care provider’s written order signed by the parent / guardian requesting the school to administer medication or to permit the student to self-administer the medication; When the medication is brought to the school in its original container stating the name of the student, the dosage and method of administration prescribed by a physician. It is the parent’s or guardian’s responsibility to notify the school of any changes to the original prescription. The new prescription must also be brought to the school in the original container as stated above; When the appropriate medication authorization form (Appendix) has been completed, signed and accompanies the medication; For any medication, parents must document the number of tablets or dosages to be secured for administration by authorized school personnel. If tablets are to be divided, the parent or guardian is responsible for dividing the tablets that are to be divided in order to achieve their child’s proper dosage. All OTC and prescription medications are to be kept locked in the clinic/school office and be administered by the school nurse, clinic aide, principal or trained designee. No student is to carry/possess medications, without appropriate medical authorization. No medication will be administered unless the school has received a signed copy of the Medication Authorization Form (Appendix). OTC medications do not require a health care provider’s signature unless the medication is required for four (4) or more consecutive days. It shall be the student’s responsibility to come to the clinic/school office at the appropriate time for medication unless a health care provider or parent indicates in writing that the student cannot do this. Students are NOT permitted to self-medicate. The school does not assume responsibility for medications taken independently by the student. Exceptions may be made on a case by case basis for students who demonstrate the capability to carry and self-administer emergency life-saving medications (e.g. inhaler, Epipen. 49 Within one week after expiration of the effective date on the order, or on the last day of school, the parent guardian must personally collect any unused portion of the medication. Medications not claimed within that period will be destroyed.